By John Meyer For more about me and my credentials, and ideas about editing, see our "About Us" page and "The Art of Editing." Editing begins and ends with making sure every word expresses precisely what the writer means. Proof reading: If you're an experienced author, confident in your skills, you may need nothing more than a careful, professional eye to catch the inevitable text glitches and typos that will be invisible to your own eye. Proof reading is also a necessary final step after the book has been set in type and before it goes to press. It ensures that the published version precisely matches the final edited draft. Basic copy editing: Finding and smoothing out a text's rough edges are a specialty. I'll help your own voice be heard, faithful to your own style, while ensuring your prose is clear, correct and compelling. Copy editing is about the nuts-and-bolts mechanics of the English language: spelling, punctuation, grammar and word usage. In-depth editing service: An informal, results-oriented collaborative process will help you shape and organize your text, identify gaps and clarify your narrative. 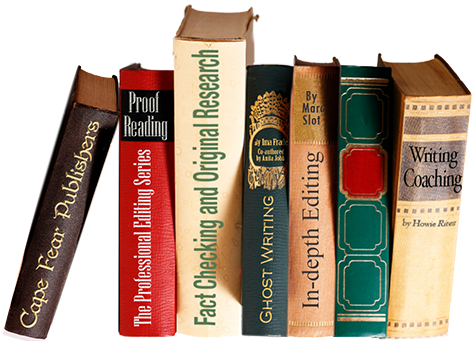 Starting from a sample chapter, I can offer recommendations about the level of editing your manuscript needs. The author's expertise in the book's subject combines with my expertise in how to tell a story or explain ideas. The result: compelling prose. Fact checking and original research: Ensuring absolute accuracy is essential for non-fiction. In fiction, avoiding anachronisms and factual errors is important for the writer's credibility. As a veteran news-media professional, I'm well qualified to verify any aspect of your story that can be checked, and advise you on historical, cultural or technical contexts when needed. Writing coaching: For beginning authors who have a story to tell, but not a lot of experience in the printed word, I can help you structure your writing to make it a pleasure for your readers. In 30-plus years as an editor, I've improved the work of hundreds of talented writers, from raw beginners to seasoned professionals. Co-author or ghost writing: Need a pro to help you tell your story effectively? I'll work with you to master your material and shape it into a readable narrative, with or without a co-author credit, as you prefer. We offer our services on either an hourly or a flat-rate schedule. When we are acquainted with an author's work, we are happy to commit to a flat rate, based on the book's estimated word count. For new clients whose writing style isn't familiar to us, an hourly rate may be better for both parties. This ensures that you get the necessary level of attention to your work, and that we are fairly compensated for our services. To assess the level of editing your manuscript needs, and to propose a rate that's fair both to you and to us, we'll be happy to review a sample chapter at no cost and with no obligation. When we have an idea of your writing style, we will make a recommendation about the scope of services and our rates. of John F. Kennedy's inaugural address.